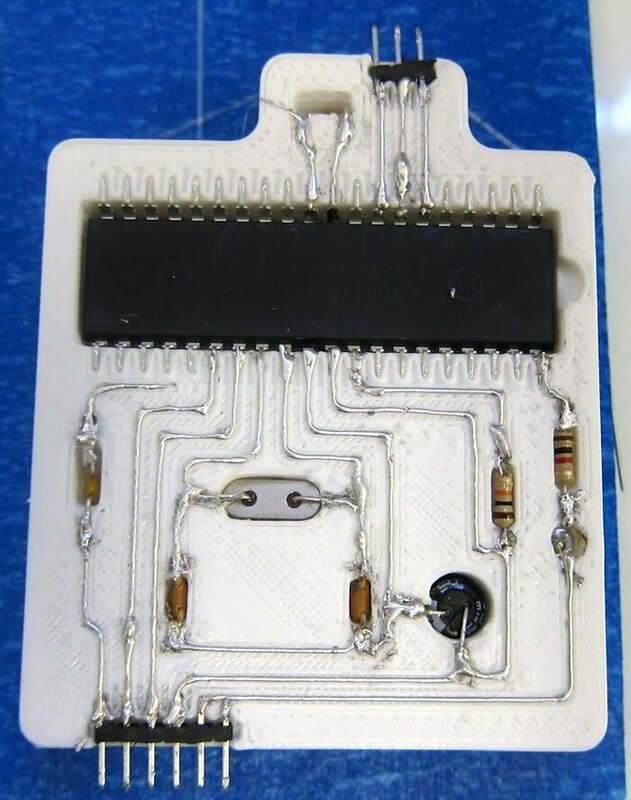 The Ponoko blog today highlighted a printed circuit created by RepRap advocate Rhys Jones, who is one of the pioneers of DIY printed circuits. He’s been working on this for a while and is making some serious progress lately, as you can see in the photo. Don’t you dare laugh at the primitive nature of what you see. This is just a first step towards 3D printed electronic circuitry. Don’t forget what home computers in the 80’s looked like. And why are 3D printed circuits so important — the :holy grail” as Ponoko put it? Because you will eventually be able to print a complex physical item, along with it’s electronic circuitry at the same time, in one print. The possibilities are mind-boggling. To accomplish this feat, Jones has modifidied his RepRap printer to have two print heads: one for plastic, and one for metal. First, he prints the plastic substrate, with cavities for the components and the tracks. Then he manually places components into their holes, before the metal tracks are printed in place.